Archbishop Borders School has the honor of being the only dual-language, Spanish-immersion school in the Archdiocese of Baltimore. As part of our commitment to the development of our dual-language program, we have partnered with the Roche Center of Boston College as part of their Two-Way Immersion Network for Catholic Schools (TWIN-CS). Through membership in this network, Archbishop Borders School receives professional development for our faculty and guidance in program development. To learn more about the TWIN-CS program, click here. Our Dual Language Program is an additive bilingual program where bilingualism, biliteracy and biculturalism are the focal points for the development of the learner. 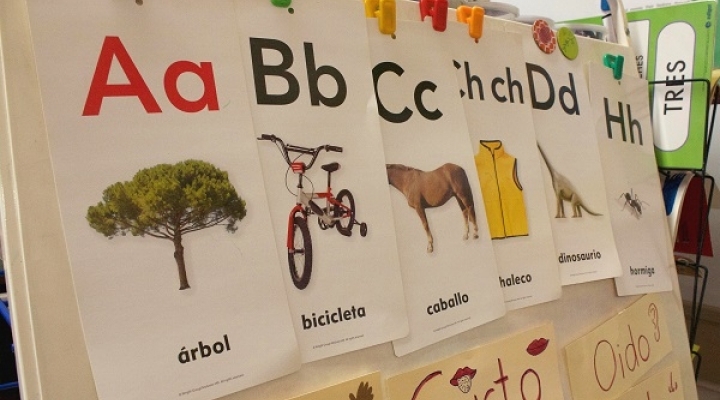 In the Dual Language Program, the language majority students (in this case, English) and the language minority students (in this case, Spanish), are served in the same classroom. Both groups of students share the same instructional strategies either in English or Spanish, to promote learning and cross-cultural cooperation. For a child enrolled in our program from PK4 or Kindergarten, the expectation is that he or she will have acquired an advanced level of proficiency in a second language (Spanish or English) and have fully developed his or her primary language (Spanish or English) by 5th grade. Through the Dual Language Program, the students understand and appreciate the cultural differences and perform at high levels of academic rigor. In Middle School, the students “refine” the academic language through some content classes in Spanish or through Literature and Grammar. For parents and guardians looking for dual-language resources, please visit our Dual Language Program Resources page. For more information about our program, please email Manuel Caceres, our Director of Dual Language Programming, at mcaceres@abbschool.com.